Here at Prairie Thunder Baking, we always use fresh ingredients and create everything from scratch. We are in the process of updating our café menu. Please contact the bakery to hear about our latest offerings! Our breads are made fresh every morning. 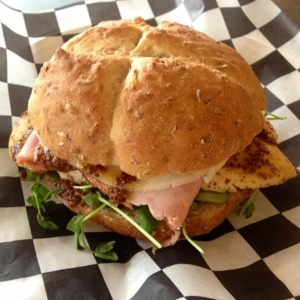 All of our breads are made from the simplest ingredients possible, contain no preservatives and are 100% natural. Our selection ranges from traditional baguettes and sourdough to seasonal and specialty breads. Baguettes: Four simple ingredients: flour, water, salt, & yeast. Classic French bread with a crackly crust and a rich, creamy crumb full of random sized holes. Classic Ciabatta: Classic Italian country bread. Lightly flecked with whole wheat, lots of holes and complex flavors. Country White: A simple yeasted white loaf with complex flavor. Found in bakeries across Europe. Sonnenblumenbrot: A German style yeasted loaf made with toasted sunflower seeds, cracked wheat, and a touch of honey. Wheat Berry: 50% coarse whole wheat loaf made with organic wholewheat berries and a hint of honey. Five Grain Levain: A sourdough loaf made with whole wheat, rye, rolled oats, sunflower seeds, and flax seeds. 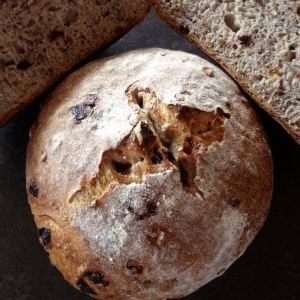 Kalamata Olive: A sourdough loaf with a touch of coarse whole wheat and an abundance of Kalamata olives. Pain au Levain: A white San Francisco style sourdough loaf, but milder. Prairie Harvest Levain: A sourdough loaf made with 70% bread flour, 24% coarse whole wheat, and 6% coarse rye. Baby Spinach Levain: 15% whole wheat bread made with shredded baby spinach. Each loaf is 10% spinach by weight. Brioche Nanterre: Light, delicate loaf of bread made with a large amount of butter and eggs. Makes great French toast! Caramelized Onion Ciabatta: Traditional Italian loaf made with bits of caramelized red onions. Jalapeño and Habañero Hummus: Each loaf is 20% house made hummus by weight. Bits of Jalapeño and Habañero peppers mixed with tahini, roasted garlic, and garbanzo beans. Parmesan Cheese Levain: Very soft loaf made with shredded Parmesan Cheese. Each loaf is 15% cheese by weight. Roasted Potato: 15% whole wheat bread made with roasted potatoes tossed in olive oil, kosher salt, and pepper. Each loaf is 14% russet potatoes by weight. Roasted Roma Tomato and Basil: 15% whole wheat bread made with roasted roma tomatoes and dried basil. Each loaf is 10% tomatoes by weight. S.p.o.ts. (Seeds piled on top of seeds): 50% honey wheat bread with a 10% mixture of seeds comprised of flax, poppy, red quinoa, and sesame seeds. Bolillos: Small oval shaped loaves. Great for sandwiches. Focaccia: Our thick house bread topped with olive oil, salt, and rosemary. Can be ordered in full sheet pan size, half sheet pan size, and 9" rounds. Hamburger, Hot Dog, Hoagies, and Sliders: Butter and milk enriched rolls and buns. Available in quantities of half dozen in either traditional bread flour or whole wheat varieties. Roll Presses: Very soft, olive oil glazed rolls attached into one big press containing 36 rolls. Great for parties. 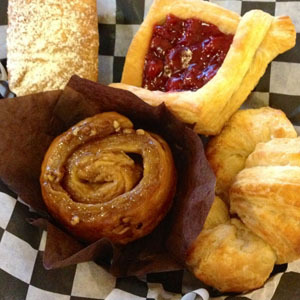 Our pastries are made fresh daily from the highest quality ingredients. A typical day might include sweets like chocolate-filled croissants, cranberry scones, cheesecake, fruit tarts, and more. We also have a range of seasonal pastries and cakes that you can enjoy in the cafe, take home for later, and order for special events. Because we make everything the day we sell it, we often sell out early. If you know that you will need a large number of pastries for a morning meeting or event, please let us know 48 hours in advance (see our Orders page for more information).